Mobile phones revolutionized Africa, and the majority of Africans now own a cell phone. The trend is only gaining momentum. Now a second revolution is hitting the continent: mobile Internet. Cell phone down to its last bar of battery charge? No problem: An old car battery stationed in the middle of the village serves as a loading station for everyone. That is a sight ethnologist Hans-Peter Hahn often observed during research trips in Burkina Faso, Togo and Ghana. "It's fascinating that cell phones are even being used in places where there is no power network," he said. In three-fourths of sub-Saharan Africa's surface area, people can use mobile phones to call each other, write text messages. The region continues to find creative ways of dealing with new technologies. A money transfer system called M-Pesa developed in Kenya has spread to other countries, bringing many people into a kind of banking system for the first time. Farmers can learn the current market prices for grain or coming weather patterns via text messages. The cell phone has become the driving force of globalization in Africa. And it speeds up each year: In 2005, just 90 million Africans had a cell phone, but by last year, that number had risen to 450 million. Chinese companies have provided African markets with brand new and cheap mobile phones, while European go-between vendors transport millions of used brand name phones to Africa. Almost everyone wins?Joachim von Braun, director of the Center for Development Research, commissioned studies on cell phone use starting 10 years ago. People reacted dismissively, saying that the rural poor needed water and food, not mobile technology. "But it has turned out that poor people in rural areas can profit immensely from these devices because these people are simply cut off from information otherwise," Braun said. Development expert Bernd Friedrich of the German Association for International Development (GIZ) is certain that developing countries will increasingly transition toward information and knowledge societies by using mobile technology. "It influences how people gather information, how they work, how they enjoy their free time and what they spend their money on," Friedrich said. Researcher Hahn said he believes families are the bigger winners when it comes to the spread of cell phones. Migrant workers can now stay in contact with their families more easily than before, when family structures often suffered or broke down as a result of distance. But those who lose out in the process, Hahn added, are those who are still too poor to afford a cell phone. "These are all pre-paid carts that have to be loaded up every six months so that they don't expire," he said. Although the costs for making calls have fallen dramatically, there are still enough people who cannot afford to load up their phones. Hahn gave the example of groups in Burkina Faso that have taken action and appealed for a fundamental right to communication. "The model is worth considering because it would lead to a greater level of equality," Hahn said. The digital divide that separates northern and southern countries in terms of their access to new technologies has shifted. "The divide is still present when it comes to Internet access," Hahn said, but noted that the divide is no longer so easy to delineate geographically. "Today it runs along social lines." Statistics show that just 12 of every 100 African residents use the Internet. "It's especially the urban population, people with more money and more men than women. Of course, it's also the younger people," Friedrich said. According to 2009 analysis by the World Bank, developing and emerging countries with increasing access to broadband networks can achieve annual additional growth of 1.4 percent. Last year, just five out of every 100 people had a SIM card in their cell phones capable of connecting to the Internet. "But that corresponds to an increase of 160 percent compared with the year before," Friedrich said. One in 11 Africans owns a computer, which is why development Friedrich said he is sure that the continent, once it has moved beyond landline communication, will make a big jump in regards to development. "We are springing directly into mobile data transfer because it is significantly cheaper than, for example, building a DSL network or offering Internet access by cable. The prices for mobile Internet could fall quickly, as they did with mobile telephone service, because more and more undersea cables from the United States and Europe are reaching the African coasts. Even countries that have faced severe turmoil like Rwanda are making progress, Braun reports. "These developments are making the cell phone into an even more powerful device," said Braun. 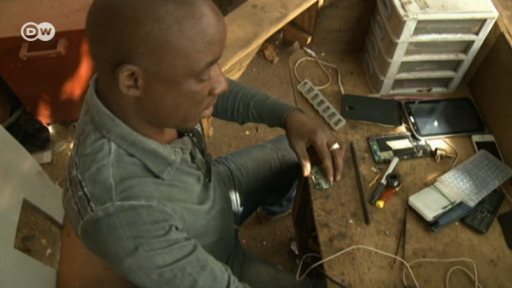 Mali's capital city Bamako is home to a bustling phone market, with hundreds upon hundreds of dealers. The market is a job engine in this crisis-ridden country.